Reposting is not something I commonly do, in fact this is the first time I've ever done a repost, but I love this lil pumpkin craft so much and it is so festive & fitting right now with the cooler weather & change of season. I posted this about a year ago, so if you never saw this or weren't following the blog back then, enjoy! & if you've already seen this, I apologize, just needing a bit of a break this month! Looking for some cute autumn diy home decor? Carve out the tops of mini pumpkins and replace with tealight candles for a warm, festive holiday glow :) These little pumpks super easy and quick to make. We already had the mini pumpkins and tealights so didn't even make a trip to the store. 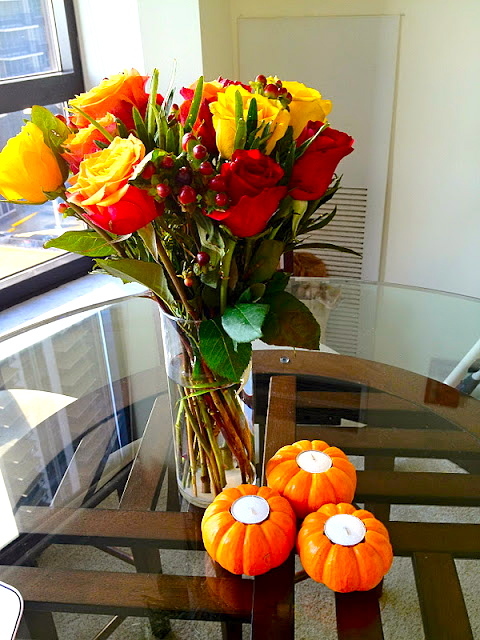 You could also use slightly larger pumpkins with votives depending on your preference or what you have at home. All you'll need are the pumpkins, candles, and a knife. Step 1: Use the tealight to mark your carving on the top of the pumpkin. Step 2: Carve out the top. (Be conservative in carving - you can always make a smaller hole bigger but you can't make a bigger hole smaller). Step 3: Insert the candle, light, & enjoy! I think they look great in groups of odd numbers, I like the three here for our round kitchen table, but if you have a longer table or coffee table you can do more, perhaps different colors (white or spray painted gold would look beautiful) and/or different sized pumpkins lined all along the center. Sidenote - This all started when I saw these pumpkin tealight candle holders in the Crate & Barrel catalog. But I definitely like our real pumpkin candle holders way better :) Happy fall decorating! I love these, such a great center piece idea. I'm going to use this Idea this thanksgiving! thanks!! the best laid plans of mice & men ..